Q1: What is UVM? What is the advantage of UVM? Ans: UVM (Universal Verification Methodology) is a standardized methodology for verifying the both complex & simple digital design in simple way. Q2: UVM derived from which language? Ans: Here is the detailed connection between SV, UVM, OVM and other methodologies. Q3. What is the difference between uvm_component and uvm_object? We already have uvm_object, why do we need uvm_component which is actually derived class of uvm_object? Q4: Why phasing is used? What are the different phases in uvm? Ans: UVM Phases is used to control the behavior of simulation in a systematic way & execute in a sequential ordered to avoid race condition. This could also be done in system verilog but manually. Q5: Which uvm phase is top - down , bottom – up & parallel? Q6: Why build phase is top – down & connect phase is bottom – up? Q7: Which phase is function & which phase is task? Q8: Which phase takes more time and why? Ans: As previously said the run phase is implemented as task and remaining all are function. run phase will get executed from start of simulation to till the end of simulation. run phase is time consuming, where the testcase is running. Q9: How uvm phases initiate? 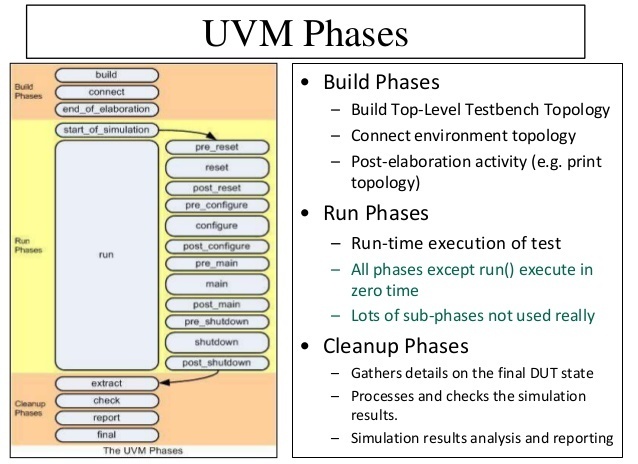 Ans: UVM phases initiate by calling run_test(“test1”) in top module. When run_test() method call, it first create the object of test top & then call all phases. Q10: How test cases run from simulation command line? Ans: In top module write run_test(); i.e. Don't give anything in argument. last line of the answer in 9th question it might be "is child class of uvm_resource_db" I think,check once. That was a typo in answer. Corrected..!! Sure we will keep updating this section. Please let us know if you have any suggestions. Great explanations. Please add more questions. We are in process to add more questions. If you have any question that can be added to this section then please write to us with Question and detailed answer at info@vlsiencyclopedia.com we would be glad to mention you as contributor.